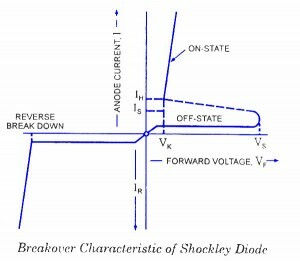 The four-layer diode, also called the Shockley diode after its inventor William Shockley, is essentially a low-current SCR without a gate. It is classified as a diode because it has only two external terminals through anode and cathode. Because of its four doped regions it is often called a P-N-P-N diode. The basic structure, two transistor version, equivalent tranÂ­sistor circuit and schematic symbol of a Shockley diode are shown in figure. The easiest way to understand how it operates is to visualize it to be formed of two transistors Qx and Q2 placed back to back, as shown in figure.b. Figure Â shows the diode split-up into two parts, displaced mechanically but connected electrically. 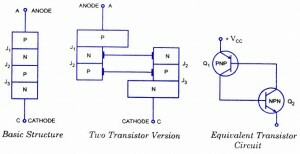 The left half is a P-N-P transistor while the right half is an N-PN- transistor. 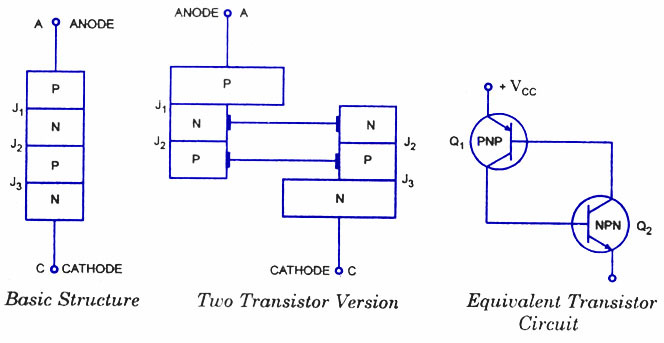 It may be seen that N-type base region of P-N-P transistor forms the collector of N-P-N transistor while P-typeÂ base of N-P-N transistor forms the collector of P-N-P transistor. Thus the four-layer diode is equivalent to the latch shown in figure. Because there are no trigger inputs, the only way to switch the device on is to increase the anode-to-cathode voltage VAK to the forward switching voltage, and the only way to open it is by low current drop out. With a four layer diode it is not necessary to reduce the current all the way to zero to open the latch. The interÂ­nal transistors of the device will come out of saturation when the current is reduced to a low value, called the holding current. The forward switching voltage Vs is equivalent of the SCR forÂ­ward breakover voltage, and the minimum curÂ­rent at which device will switch on is the switchÂ­ing current IS. 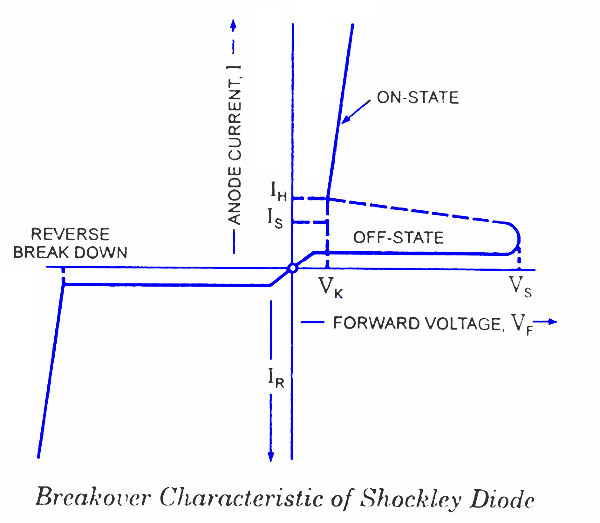 Voltage-current characteristic of a Shockley diode is shown in figure. The device has two operating states: conÂ­ducting and non-conducting. In non-conducting state, it operates on lower line with negligible current and a voltage less than switching voltage or breakover voltage. When the voltage tries to exÂ­ceed the breakover voltage, the device breaks down and switches along the dotted line to the conducting or on-state. The dotted line indicates an unstable or a temporary condition. The device can have current and voltage values on this dotted line only briefly as it switches between the two stable operating states. 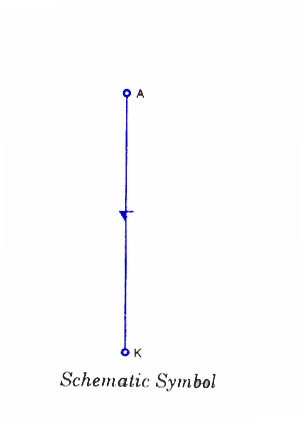 In conducting state or in on-state, the device operates on the upper line. As long as the current through the device is greater than the holding current IH, then the voltage across it is slightly greater than knee voltage, VK. When the current falls below the level of the holding current IH, the device switches backÂ along the dotted line to the non-conducting or off-state. 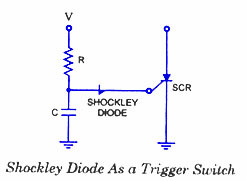 One common application of the Shockley diode is as a trigger switch for an SCR. The circuit is shown in figure. When the circuit is energized, the capacitor will start getting charged and eventually, the voltage across the capacitor will be sufficiently high to first turn-on Shockley diode and then the SCR.Another application of this diode is as a relaxation oscillator.